Leading L.A. bartender Brady Weise shares simple, yet crucial ways to make a better mojito. 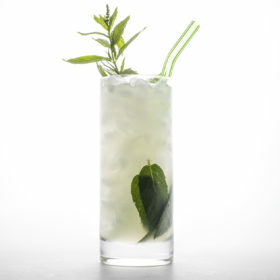 Mojito, derived from the West African word “mojo,” means to cast a little spell. No doubt, this quintessential summertime sipper has done just that worldwide. Even Ernest Hemingway became hooked upon discovering the drink at La Bodeguita del Medio in Havana, the drink’s alleged birthplace. Somewhere along the way, however, the minty libation has become, well, muddled up. In honor of August’s National Rum Month, we caught up with Weise, also the creator of the Grippit bar tool, for his advice on rekindling the magic to make a top-notch mojito. Use dry rum, and just say no to flavored rums. Try: Ron Flor de Cana, Brugal Especial Extra Dry, or St. George California Agricole. Minimize your mint. A little goes a long way. Press the mint leaves lightly with your palms. Add the leaves into the bottom of a Collins glass. Add simple syrup and lime juice. Fill the glass half full with crushed ice. Stir the ingredients gently (no more than 5–7 seconds) to chill. Layer the rum over the mixture. Add more crushed ice, and stir gently for 3–5 seconds. Continue to layer ice until the glass is full. Garnish with the mint sprig. Serve with a straw.